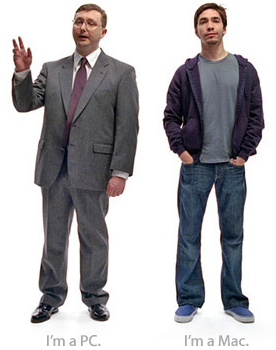 On August 27, 2006, during the Emmys, Apple showed off three brand new “I’m a Mac and I’m a PC” advertisements. Steve Jobs had stated that he had over 20 more “in the can” during the WWDC, when he announced the new Mac Pro. These ads are a powerful marketing scheme for Apple and on a plus side many of these are quite true, but a few are just innacurate. Taking a look at these three, to begin with the “Accident” ad is appropriate because the MacSafe power cord is a unique feature which is only offered on Macbooks and Macbook Pros, while no other equivalent feature is offered by other hardware manufactures. However the second Ad, about iPhoto, is a bit overdoing it since there are thousands of applications to manage photos for Windows. Although Macs may come ready with iPhoto software, plenty of free organization and editing tools are available for Windows. The third Ad claims that Macs don’t get viruses. Since Apple’s Mac OS only holds a few percent of the market share, most spyware apps and viruses are usually targeted at larger audiences. Although their claim may be true for the time-being, more Mac-targeted viruses will find their way as more users start using Macs. Before you make the comment “Apple has only a small market share and this is the reason for it not having current problems with Viruses” first requires understanding ‘graphic platforms’ and built in ‘firewalls’ that stop these bugs from entering. This has nothing to do with production levels. Apple far exceeds PC’s in performance innovations including it’s own OS over Windows OS. PC’s work on a ‘text platform’. Because of this (which has been from the beginning) PC’s have little protection from outside intervention. Apple will always been immune to the PC problem. Edit: Apple will always BE immune to the PC problem.